Thirteen Faced Rudraksha or Troydash Mukhi Rudraksha has thirteen natural lining on its face. This bead is generally found in oval or round shape. The deity of this Rudraskah is Cupids (Kamdev) and the ruling planet is Venus and Lord Indra. Though Venus also governs Six Faced Rudraksha, this Rudraksha is considered to have more power. Venus in astrology is known to give beauty, attraction, sexual power and worldly pleasure. The power of Venus is strengthened and the wearer is blessed with both worldly desires and spiritual attainments. Thirteen Faced Rudraksha should be worn by those who have public contacts. Since this Rudraksha gives power of attraction, public automatically is attracted towards the wearer of this bead. This is best suited to politicians, leaders and the persons involved in marketing etc. This Rudraksha is considered auspicious for mediation. 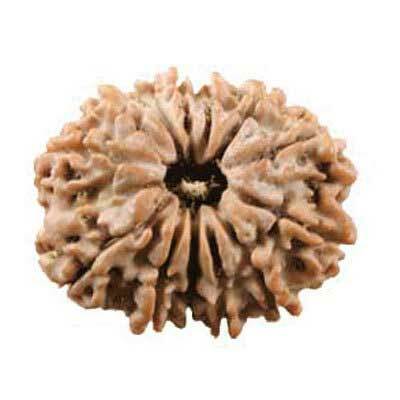 This Rudraskah helps a person to overcome diseases related to Venus.